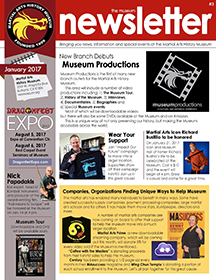 Join us as we celebrate the life of 2001 Martial Arts History Museum Hall of Famer Richard Bustillo. One of the original students of Bruce Lee and one of the leading authorities on Filipino arts and continuous supporter and contributor to the Museum, let’s pack this place out as we give honor to the Richard Bustillo. Cost is only $10. Join us as we honor the “Best Martial Arts Radio Talk Show in America!” Let’s celebrate the life of the hosts, Restita DeJesus and Robert Deahl at this amazing event. Bring your friends, bring your enemies, join us at 4 pm at the Museum. Cost is only $10 and you will have a great time. Please join us as we celebrate and Honor icon Richard Nuñez for his many accomplishments in his life. From Co-founder in Lima Lama to Creator of the NoKaOi system. A pioneer in the Arts, to Security to the Stars and a family man who admires his wife and Children. Join us on February 25, 2017. Cost is $10.00 at the door. We look forward to seeing you. THE MUSEUM TOUR: In the works is our first ever, downloadable and dvd of a Tour of the Museum. We realize not everyone can make it to Los Angeles to see the Museum, so we are bringing the Museum to you. For just $10, you can download a streaming video of the Museum. Or for $19.95, you can purchase the DVD of the tour. Led by Museum president Michael Matsuda, you will enjoy this video.